For the real and solid supporters of the PDP-Laban presidential bet Rodrigo Duterte, the hate post against their president are not new and shocking for them but they're always vigilant on every moves of their opponents. While browsing for our new post, we found this exaggerated post of an anti-Duterte on X.rappler website. He used a code-name 'Light Bringer' and put the title 'Glimpse of Duterte’s presidency' on his article. He said that his article was based on Duterte's statements and platform. But if you read it, you'll see the deep and emotional extreme dislike of a writer to Mayor Duterte. He created an imaginative story about the first day of Rodrigo Duterte on Malacanang. 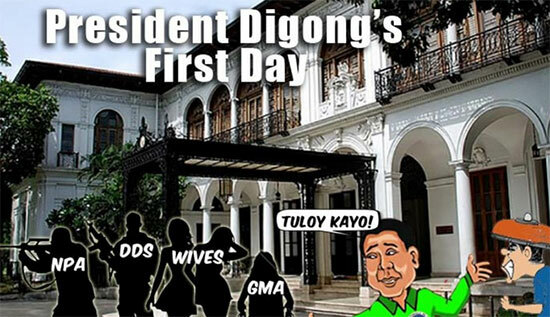 "On the first day of Digong as president, he is having problems on how he will let all his “wives” reside inside the palace. So, he made some arrangement on the assignment of rooms for his women. Another thing that he needs to pay attention is that who to present to the visitors as his first lady. Leave everything to Inday Sarah, nobody is to be the first lady but she. What are we going to call the ladies in the palace, concubines?" "On the succeeding days, we will witness that the New People’s Army and the Reds will be inside the palace and even given positions by the president. Not enough for the shock of our lives that the president will allow Former President Gloria Arroyo to have her liberty and everything is going his way, the violent way. Bodies of criminals and even perceived only criminals will be found from one place to another as he promised." "Not everybody will agree to his ways and will be militant about the situation. Before we know it, we have a new martial law in the Philippines and the new dictator is Digong. This will happen even before the transition to federal system is taken into process by the Kamara. In the middle of the 3 to 6 months of cleaning. Many people will die and even innocent victims will be silent since the president is using not only the Armed Forces to wipe out every element in the society who is against his will, but even the former Reds and rebels." "If we are looking at chaos at this point, well, it really is exaggerated. The truth is, if these really happen, Digong will have one solution to put everything in control, be a Dictator that he is. Just a play of imagination but it was all based on his statements and platform." What do you think on his post? you may use the comment box below to share your thoughts. Comments or suggestions about "Anti-Duterte exaggerated post against Duterte’s presidency" is important to us, you may share it by using the comment box below.